Installation of the 2012 Berkshire Salon. 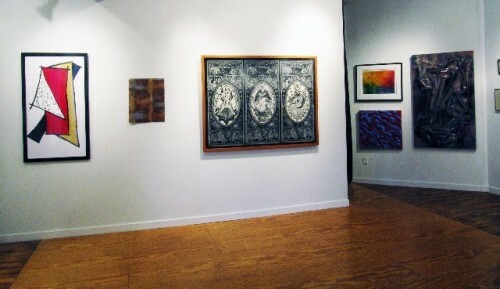 A detail of the 2012 Salon. Now in its sixth year the annual Berkshire Salon, organized by the Eclipse Mill Gallery in North Adams, is a much anticipated exhibition. For a modest handling fee of just $15 all artists are invited to participate. The Berkshire Salon will run from May 10 to June 2. The opening reception will be held from 6 to 8 PM on Friday, May 10. Artists who wish to participate may deliver work from 3 to 7 PM on Sunday, May 5 and Monday, May 6. Please fill out and bring the application for which a pdf link is indicated below. One work in all media will be accepted. The work must be suitably framed if two dimensional and ready for hanging. 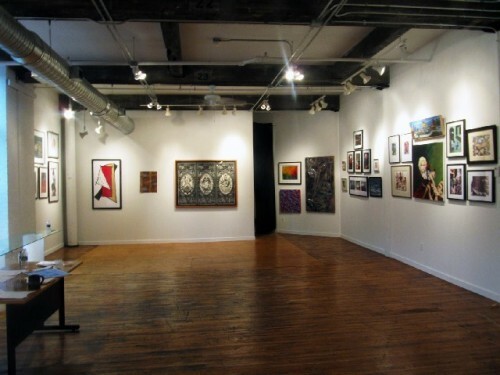 The gallery reserves the right to reject submissions that do not meet normal standards for secure handling and installation. For sculptures, other than table scaled objects, the artist must provide a pedestal or other means of display. A single work may entail two or three components but should be of reasonable dimensions when assembled. The exhibition will be installed "salon" style. Artists must deliver and pick up the works. There is no space to store packing materials. For further information and an application form click on the URL below. Welcome to the Sixth Annual Berkshire Salon! The Berkshire Salon is an annual un-juried exhibition hosted by the Eclipse Mill Gallery, open to participation by all Berkshires-based artists who are at least 21 years of age. Artists will be accepted into the exhibition in the order in which their applications are received, up to the limit of available space. Works must be delivered ready to be installed, with pieces to be hung on walls suitably framed and wired. Any special installation hardware beyond standard picture hooks must be supplied with the work. Artists submitting 3D works must provide a suitable pedestal or other appropriate means for display. Only one work per artist, which may be multi-part, will be accepted into the exhibition at the discretion of the curators. Works must be clearly labeled with the name of the artist, title of work, medium, date, and dimensions. Any packing materials must be kept in the artist’s possession, as we are unable to provide storage. The Eclipse Mill Gallery is unable to provide insurance of any kind for the works it displays. While appropriate precautions will be taken during installation, exhibition, and de-installation, we cannot accept responsibility for any damage or loss. Your signature on the application below will serve to release the Eclipse Mill Gallery and its committee members from any and all liability in the event of any damage to or loss of your artwork. 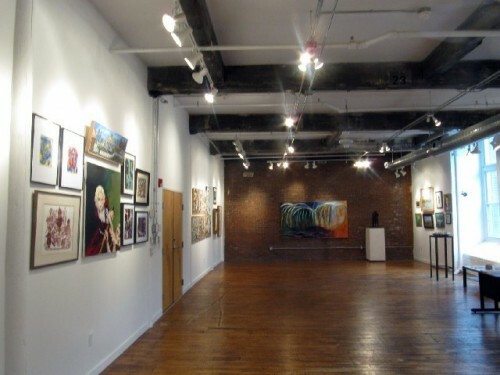 In addition, should an artist make a sale as a result of participation in the Berkshire Salon, we suggest and encourage a donation to the Eclipse Mill Gallery equal to 15% of the purchase price. Your signature below indicates that you agree to the terms and conditions outlined above.